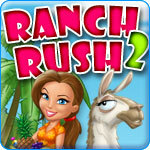 Ranch Rush 2 - Sara's Island Experiment Game - Download and Play Free Version! The incredibly addicting Ranch Rush is back and better than ever! Ranch Rush 2: Sara's Island Experiment is the brand new Time Management game from the team that brought gamers Ranch Rush, and this time the challenges are bigger and better. Spunky Sara is back - this time along with a cute monkey sidekick called Coco - and gamers who enjoy the minutia of time management challenges will love to help Sara set up her ranch in the teeming tropics. 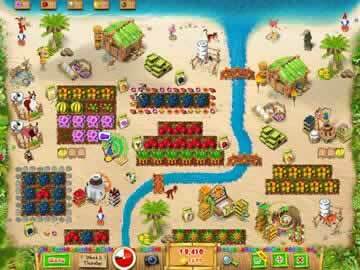 Time Management games are usually fast-paced, and Sara's Island Experiment is no exception because players will find themselves hard pressed to help Sara populate her exotic farm within the time allowed. Goal-setting is also allowed - even encouraged - and players are rewarded for such constructive behavior by being able to collect sparkling gold coins. Harvesting funky fruits and veggies has never been this easy although Sara's life isn't all fun and games as villains abound who are dead set on making sure that her fields are never full. 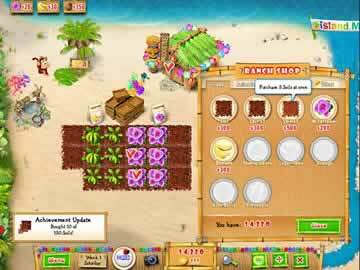 With bright and colorful graphics - not to mention Sara's cute tropical outfit complete with straw hat - order will prevail, however, and taming the tropics has never been as much fun as it is in Ranch Rush 2: Sarah's Island Experiment.